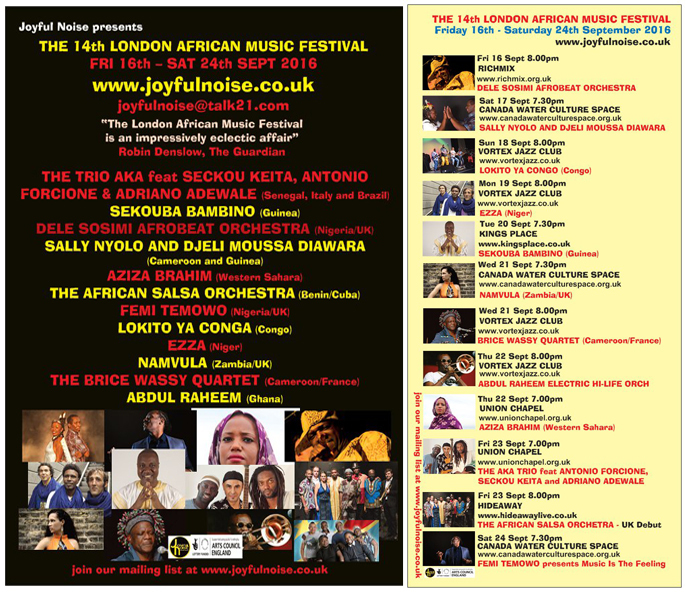 There are performances by NAMVULA who creates a multi-facetted music, SEKOU KEITA joins forces with guitarist ANTONIO FORCIONE and percussionist ADRIANO ADEWALE, new band LOKITO YA CONGO makes their debut with dance music of the highest order. The incredible EZZA brings their Touareg groove to the Vortex Jazz Club and guitarist FEMI TEMOWO and his 10-piece orchestra close the festival performing music from his brand new CD. 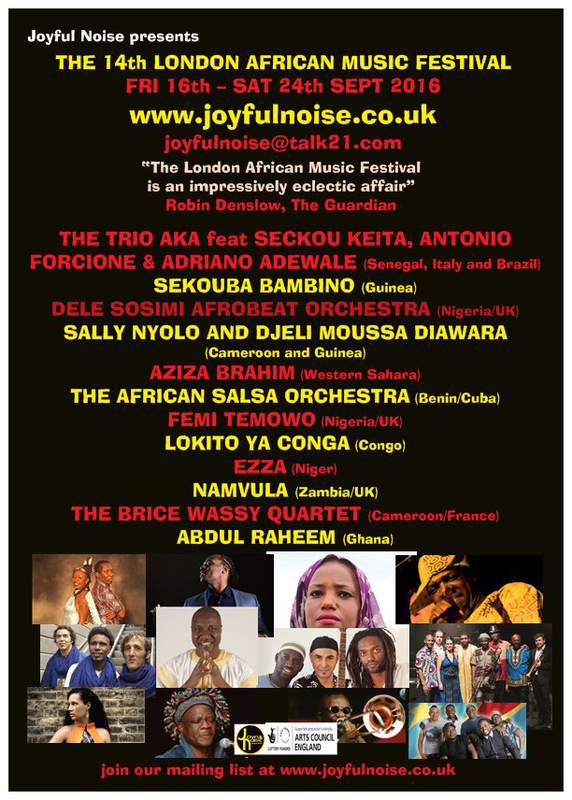 Afrobeat superstar Dele Sosimi started with Fela Anikulapo-Kuti’s Egypt 80 in 1979. He was Fela’s pianist for seven years, recording and touring with the great man. Fela Anikulapo-Kuti was the founder of the style of music known as Afrobeat. Today Dele Sosimi flies the Afrobeat flag with brilliant CDs. Tonight he leads his AFROBEAT ORCHESTRA as they play from his new cd “You No Fit Touch Am” an incredible recording that shows why John Stevenson, EjazzNews says `Sosimi creates some of the most bewitching grooves in modern African music”. The divine vocalist SALLY NYOLO and kora superstar DJELI MOUSSA DIAWARA present for the first time in the UK their magical collaboration "MVETKORA" playing two ancient string instruments - mvet and kora. This is an unique and enchanting journey, from Fang country to Mandingo empire, from Sahel and Rainforest, from Cameroon and Guinea, from Mandingo and Beti traditions. Lokito Ya Congo, led by Renato Mondele, brings a new style to Soukous. Whilst keeping their roots firmly in Kinshasa, they fuse the styles of modern Africa and their sound is joyous with vibrant melodies that are sweet while rocking the dance floor. With four albums released Lokito Ya Congo are the sound of the young Africans. Niger's EZZA are guitarist Goumour 'Omar' Adam, bassist Menad Moussaoui and drummer Stéphane Gratteau. They create Tuareg grooves where African rhythms meet modern rock sounds resulting in rhythmic trances and relentless groove. Ezza creates trance groove that is impressive for a three-piece. Guinea’s superstar Sekouba Bambino is one of the great voices of African music. He became a star at 19 when he joined Bembeya Jazz. Since then he has released numerous albums as a leader and recorded and toured the world as a great band leader and as a soloist with Africando. His vocal prowess make his show a must. Zambia folk songstress Namvula wows critics with her debut CD Shiwezwa. Namvula means "mother of rain" in Zambia where she was born of mixed Zambian-Scottish heritage. The music references Zambian folk music, urban music and elements of Scottish folk, jazz and Latin rhythms. Totally unique music. First UK show in 7 years by Brice Wassy for one of the world's greatest drummers. Renowned for his peerless work with Manu Dibango, Salif Keita, Miriam Makeba, Jean Luc Ponty, Airto Moreira and many others. Tonight he leads his French-African Quartet featuring bassist BERTRAND BERUARD, vibraphonist GASPARD JOSE and saxophonist MACIEK LASSERE. Expect intricate drum grooves and rhythms. Trombonist Abdul Raheem returns to his Afro-Funk roots with his "ELECTRIC HI-LIFE ORCHESTRA". They play authentic Ghanaian Hi-life which is driven by infectious African rhythms and to make it unique Abdul Raheem added the musical techniques of jazz funk. THE ELECTRIC HI-LIFE ORCHESTRA are ABDUL RAHEEM (lead vocals and trombone), BISHOP SAMSON (tenor sax), KOFI ADU (drums), ISAAC TAGOE (congas), JAKE ELKAN (guitar), ZOZO SHUAIB (bass) and JULIUS UCHE (keyboards). Western Saharan singer Aziza Brahim’s new album 'Abbar el Hamada' (Across the Hamada) is a commanding and compassionate musical statement about, and for, the tumultuous age in which we live. Raised in a Saharawi refugee camp in the Algerian desert, and living in exile for more than two decades (first in Cuba and currently in Barcelona), Brahim’s life and music embodies both the tragedies and hopes of the present-day migrant and refugee experience. Aziza Brahim makes a welcome return to the festival which kick starts her international journey in 2009. Tonight hear one of the world's greatest singers in London. Trio AKA are kora master SECKOU KEITA from Senegal, guitar virtuoso ANTONIO FORCIONE is from Italy and percussion visionary ADRIANO ADEWALE from Brazil. Together they create mesmerising music that takes your breath away. Adriano Adewale’s percussion sounds evoke the spirit of the forest one minute and the next his infectious grooves lay the foundation for Seckou Keita’s magical rhythms and the acoustic guitar lines of Antonio Forcione . Together three masters sounding as one. A rich chemistry of cultural influences that makes their group one of the best in the world. The African Salsa Orchestra led by Michel Pinheiro is a dancing machine that makes you dance from Cotonou to Cuba. A journey in which the Manding rhythms, gospel, rhythm and blues and reggae associate with Cuban salsa. Salsa is a mixture of voodoo cults and Western music. Cubans have added piano and brass while the drum came from the Yoruba of Nigeria. Femi Temowo Nigerian-born British jazz guitarist, musical director, producer and broadcaster is described by Time Out magazine as "one of Europe's finest and most sought after guitarists." He was nominated for the Best Jazz Act MOBO Award (2012). Over the years he has played with the likes of George Benson, Courtney Pine, Amy Winehouse, The Roots to name a few. After studying at Leeds College of Music and Middlesex University he has developed personal musical style that mixes jazz solos with African grooves that makes his music special. Tonight he plays from his new CD "The Music Is The Feeling". An incredible CD that showcases his writing skills and ability to create grooves that take your breath away.